An Ashland company has teamed up with an East Coast engineer who has figured out how to generate cheap, clean electricity from a plant all too familiar to people who frequent the Lithia Park ponds — duckweed — and then use exhaust from the generator to grow more duckweed. Pacific Domes of Ashland, a global marketer of geodesic domes, is now selling BioEnergy Domes developed by Rudy Behrens, an aerospace engineer whose patented system is capable of producing a megawatt of electricity for the same price as coal or nuclear energy — and significantly cheaper than wind or solar. The systems are green, sustainable, and can be either small enough for a single home or large enough for a municipal utility. Rudy Behrens, a Rutgers University and State University of New York-trained aerospace engineer, has spent the better part of 40 years developing sustainable technologies. To him, piecing together biological elements to produce both food and energy is a simple concept. The complex part, he said, has been finding the right mix of elements to produce a 100-percent green biomass energy unit. Over the past few years, he developed a biomass-burning, electricity-generating device whose water-vapor and carbon-dioxide exhaust is fed back into a greenhouse where it, in turn, helps grow more biomass. Behrens' BEAR Group took the final steps toward his revolutionary technology — which he says can produce electricity more reliably and cheaply than solar or wind — in labs rented from Rutgers' Institute for Marine and Coastal Studies. Last year, he erected a 200-kilowatt electric generator in the Philadelphia Technology Park, once a Navy shipyard. "At the moment," Behrens said. "It's the only operational one; we wanted to build it and get it working right. They're trying to make it a green energy hub and use it to attract green manufacturing." Behrens, who was in the Rogue Valley this past week, said the present technology grew out of ocean energy projects he pursued in the mid-1990s. His technology uses biomass grown inside of automated, climate-controlled greenhouses within geodesic domes. The critical ingredient, the fast-growing biomass that makes the project viable, is duckweed, a solution that should come as no surprise to those who have seen the plant blanket the ponds in Lithia Park each summer. "It's a little, water-born plant that doubles in mass every 24 hours. The ducks really like it," Behrens said. 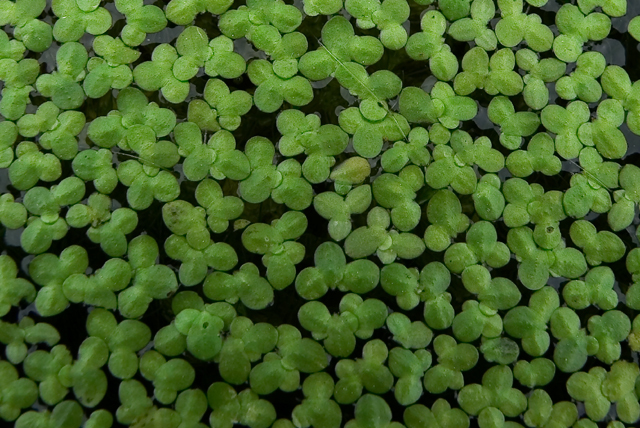 Two pounds of duckweed seed in a 32-foot tank in Philadelphia grew to a depth of 2 inches in 10 days, he said. "It's very easy to harvest," Behrens said. "That was the undoing of a lot of algae concepts. You can't spend too much energy removing fuel from water, otherwise on your balance sheet you haven't made any energy." Duckweed is smaller than a grain of rice, but a million times bigger than an algae cell, he said. The duckweed is harvested with a nylon mesh, similar to screen doors, then dried. In many ways, it's similar to wood-products waste, another type of biomass, which is used to generate electricity in White City and other places around the country. "Trees don't grow fast enough, so we found something that grows faster," Behrens said. "The key is growing fuel on site, because shipping it in is too costly. We just had to find a fast-growing plant — and there are plenty of those — and then create an artificial environment that optimizes plant growth." The artificial environment — BioEnergy Domes — is where Pacific Domes comes in. There are four sizes of BioEnergy Domes, ranging from a backyard-sized, 5,000-kilowatt version that can supply energy for one home to a commercial-size, 60-foot-diameter unit, such as the initial unit in a Philadelphia industrial park. The generating unit sits outside the dome and runs silently. Behrens said it costs about $750,000 to $800,000 to install the largest BioEnergy Domes, and the payback time is only two years. "You are able to generate electricity at the cost of 3 cents per kilowatt hour, the same as coal or nuclear plants," Behrens said. "It's completely controllable, unlike wind or solar power, and generates on demand like a fossil-fuel plant." Behrens and Pacific Domes owner Asha Deliverance are doing a feasibility study, hoping to construct a cluster of five of the large BioEnergy Domes that could supply 1 megawatt of electricity, enough to power 500 homes. Behrens said such clusters would be ideal for municipally-owned utilities such as Ashland's. Backyard models cost about $15,000 for do-it-yourself installation, although the company provides instructions and support, said Oliver Fix of Pacific Domes. His major obstacle, Roberts says, is educating local officials about what he's doing so he can get through the permitting process. "We're having to deal with the land-use planning people, Fish and Game, water resources and lot of state agencies," he said. "Everyone wants to know what's going on, and they definitely want some money." "Hopefully," he said, "we'll be through the process in time to take vegetables to market when the tourists come."